Keynotes in Organic Chemistry. Andrew Parsons F.
This concise and accessible book provides organic chemistry notes for students studying chemistry and related courses at undergraduate level, covering core organic chemistry in a format ideal for learning and rapid revision. The material is organised so that fundamental concepts are introduced early, then built on to provide an overview of the essentials of functional group chemistry and reactivity, leading the student to a solid understanding of the basics of organic chemistry. Graphical presentation of information is central to the book, to facilitate the rapid assimilation, understanding and recall of critical concepts, facts and definitions. 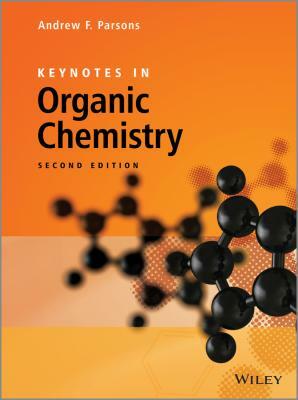 Students wanting a comprehensive and accessible overview of organic chemistry to build the necessary foundations for a more detailed study will find this book an ideal source of the information they require. In addition, the structured presentation, highly graphical nature of the text and practice problems with outline answers will provide an invaluable framework and aid to revision for students preparing for examinations. Keynotes in Organic Chemistry is also a handy desk reference for advanced students, postgraduates and researchers. For this second edition the text has been completely revised and updated. Colour has been introduced to clarify aspects of reaction mechanisms, and new margin notes to emphasise the links between different topics. The number of problems have been doubled to approximately 100, and includes spectra interpretation problems. Each chapter now starts with diagrams to illustrate the key points, and ends with a list of key reactions and a worked example.